Data on the Mineral occurrence and geological observation data packages is derived from the surface geology system in MERLIN, which is our corporate relational database. The data has been decoded and concatenated into simple, relational database structures with MS Access software interfaces and in-built forms and queries to interrogate the data. Most tables include latitude and longitude, and MGA zone and coordinates for easy display in GIS software such as ArcGIS and MapInfo. Many tables have also been populated with corresponding rock unit and structural unit names from MERLIN. 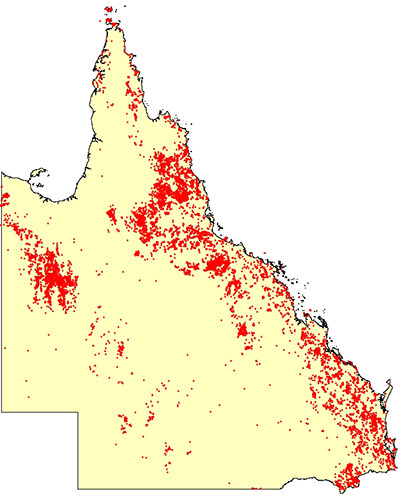 Queensland mineral occurrence data includes geological and statistical information on operating mines, abandoned mines, active and dormant mineral prospects, and known mineral occurrences in Queensland (PDF, 214KB). bibliography for each individual deposit, along with comments. 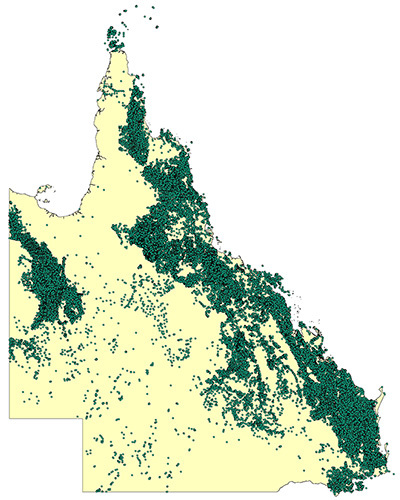 Geological observation data (approximately 182,000 sites) has been captured during the Geological Survey of Queensland (GSQ) geological mapping activities since 1986. The geological observation database includes data on rock types and rock characteristics, such as colour, grain size, texture, structural measurements and formation name. It also includes isotopic dates and whole rock geochemistry. Here is an image showing the distribution of geological observations that GSQ has collected since 1986, including some data captured from earlier field notebooks. Approximately 2,650 isotopic dates (SHRIMP, U-Pb, K-Ar) include age determinations obtained through GSQ regional mapping activities and also from many other sources available in the public domain. The whole rock chemistry is a compilation of all the analyses (12,720) from GSQ regional mapping activities and analyses completed in conjunction with Geoscience Australia. These analyses have been used to classify rock types and improve understanding of Queensland's geology. You can download the Geological observations data package from QDEX Data. You can download the Mineral occurrence data package from QDEX Data. You will need Microsoft Access 2000 software (or a later version) installed on your computer to view the data.